Two Israeli soldiers have been shot dead by a Palestinian in the occupied West Bank, the Israeli military says, amid an upsurge of attacks in the area. Two other people were severely injured when the gunman fired at a bus stop. A hunt for the suspect is under way. It took place near the Ofra settlement, where a separate shooting on Sunday by a Palestinian led to the death of an Israeli newborn boy. Dozens of Israelis have been killed in such attacks in the past three years. Israel earlier said it had found and shot dead two suspected Palestinian attackers - one who they said carried out Sunday's shooting, and the other suspected of killing two Israelis in an attack on a factory in a West Bank settlement in October. Palestinian militant Islamist group Hamas has said it was behind those attacks. A Palestinian driver who attacked a different bus stop in Ramallah later on Thursday was also shot dead, according to Israeli media. What do we know about the latest attacks? The two soldiers who died have been name as Sgt Yuval Mor Yosef, 20, and Cpl Yosef Cohen, 19. 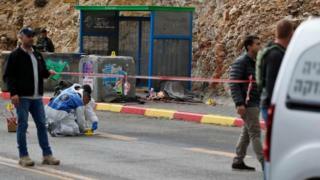 Their attacker stepped out of a car and shot at soldiers and civilians at a bus stop near Ramallah before fleeing towards the city, an Israel Defense Forces (IDF) spokesperson said. "There was massive fire, bullet after bullet, but not in bursts," an eyewitness told Israel's Haaretz newspaper. A seriously injured man and woman were both taken to hospitals in Jerusalem for treatment. The Israeli army said it had closed all entrances and exits to Ramallah city in a bid to find the attacker. Later, the IDF said it had "neutralised" a Palestinian who had attempted to ram his vehicle into a bus stop in Ramallah, injuring another Israeli soldier. Israeli reports said he had been killed by the security forces. Earlier, Israeli security forces shot dead two Palestinians who they said were behind two recent high-profile attacks in the West Bank. One of them was Salah Barghouti, 29, who was killed in an operation in a village north of Ramallah late on Wednesday, according to Israeli security forces. They said he was behind a drive-by shooting in the West Bank on Sunday that left seven Israelis wounded. Among those was a seven-month pregnant woman, whose newborn baby died on Wednesday after delivery by emergency caesarean. Israeli security forces also announced the end of a two-month manhunt for Ashraf Naalwa, 23, who was accused of an attack at a settlement industrial park on 7 October that left two Israelis dead and another injured. Israeli forces said Naalwa was killed as they tried to arrest him near the West Bank city of Nablus. Hamas has said that both men were members. On Tuesday an unnamed senior IDF official told Israeli newspaper Haaretz that Hamas was plotting more attacks than before. In a separate incident, Israeli police say a third man was shot dead in Jerusalem's Old City overnight after he wounded two Israeli officers in a stabbing. The identity of the attacker has not yet been revealed. Meanwhile on Wednesday, Palestinian health officials said a four-year-old boy had died several days after being hit with shrapnel in clashes between Palestinian protesters and the Israeli army along the Gaza border. Israel has said it will look into the incident. Israeli Prime Minister Benjamin Netanyahu said on Thursday that there would be no ceasefire with Gaza, which is run by Hamas, while such attacks took place in the West Bank. He also announced he would legalise thousands of settlement homes that had been built in the West Bank without even Israeli permits. "They think they can uproot us from our land, they will not succeed," Mr Netanyahu said in a statement. More than 600,000 Jews live in about 140 settlements built since Israel's 1967 occupation of the West Bank and East Jerusalem - land the Palestinians claim for a future state. There are also some 100 outposts - small settlements built without the Israeli government's authorisation - across the West Bank.